As a school administrator, instructional coach, or teacher leader, you know that reflective teachers are effective teachers. 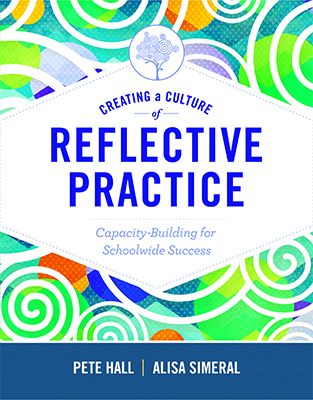 But how can you help teachers become self-reflective practitioners whose thoughtful approach translates into real gains for student achievement? In Creating a Culture of Reflective Practice—a companion volume to their teacher-oriented book Teach, Reflect, Learn—authors Pete Hall and Alisa Simeral draw on lessons learned from educators across grade levels, content areas, and district demographics to present a definitive guide to developing a culture of reflective practice in your school. Hall and Simeral expand on ideas originally presented in Building Teachers' Capacity for Success to help you gain a clear understanding of your role and responsibilities—and those of your teachers—within each stage of the Continuum of Self-Reflection. Armed with the book's real-life examples and research-based tools, you'll learn how to determine the current location of all stakeholders on the continuum and how teacher-leadership activities, transformational feedback, and strategic coaching can move them forward. The end result? A schoolwide culture that both values reflection and uses it to ensure that teachers—and their students—reach their fullest potential.